We’d love your help. 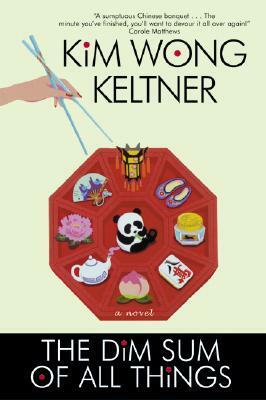 Let us know what’s wrong with this preview of The Dim Sum of All Things by Kim Wong Keltner. Why Asians love "Hello Kitty"? What the tattooed Chinese characters really say? How to achieve feng shui for optimum make-out sessions? Where Asian cuties meet the white guys who love them? an authentic Chinese banquet where Number One Son shows off his language skills by speaking "Chinglish"
To ask other readers questions about The Dim Sum of All Things, please sign up. Absolutely hilarious. I finally feel like I am reading about someone I can relate to. This fictionalized ABC (American Born Chinese) and her (mis)adventures in dating, work, family and life in general ring far-too-true for comfort at times. I cringed at my OWN memories while reading the equally cringe-worthy (though much more amusing as it wasn't happening to me) experiences she had while finding the right guy (what does she call those yellow-fever types again?) among other job and family related Absolutely hilarious. I finally feel like I am reading about someone I can relate to. This fictionalized ABC (American Born Chinese) and her (mis)adventures in dating, work, family and life in general ring far-too-true for comfort at times. I cringed at my OWN memories while reading the equally cringe-worthy (though much more amusing as it wasn't happening to me) experiences she had while finding the right guy (what does she call those yellow-fever types again?) among other job and family related (is) fiascos (too strong of a word?). There were a few funny moments in this book but overall it wasn't that great. It's about a Chinese-American girl who begins dating a white guy. The back cover sounded so funny, I was really disappointed. I really liked this book but not necessarily for the actual writing of it but due to one simple reason. It is slightly like how me and my wife got together in book form. We are a mixed race couple. My wife Chinese and myself Caucasian. There was some racial barriers put in front of us that we got over. So I can relate in a way to the characters. Amy Tan she is not. A "3rd generation" Chinese woman growing up in SF and her world viewpoint. I thought it might be funny and interesting to relate to Lindsey's story. Turns out there is no story. I think the *aim* was for a Bridget Jones genre love story. Plenty of authors don't have a story per se (David Sedaris), but Wong Keltner had little ability in creating a character. She merely listed observations of a Chinese woman's viewpoint with a wee bit too much snark and not enough humor. The bo Amy Tan she is not. Plenty of authors don't have a story per se (David Sedaris), but Wong Keltner had little ability in creating a character. She merely listed observations of a Chinese woman's viewpoint with a wee bit too much snark and not enough humor. The book is also written in the 3rd person, which distances the reader further from any possible relation to Lindsey. Brand name dropping, for no purpose: I felt like I was standing under a tree at Costco for fear I'd get bombed again. Most annoying, she made use of waaay too many similes. Not funny or insightful, or even particularly well-written. The protagonist spends the book trying to avoid white men who have a fetish for Asian women but falls for one anyway. She doesn't spend any time at all examining why she (a Chinese woman) is attracted to white men. In fact, she and her (also Asian) best friend have never dated Asian men. Seriously, one girl tells the other, "I hear they (Asian men) have small penises." This book is the Dim Sum of unexamined interracial dating. Avoid. There are plenty of Asian-American-struggling-to-reconcile-two-cultures books out there. This wasn't bad, but it wasn't all that great either. One memorable part, however, is the kitty-chan toaster and the drinking of ovaltine. =) Read to find out what I mean. If you're looking for a book about that particular struggle (and oh, I've read plenty of them) Gish Jen's Typical American is a good choice. Another one I'm quite fond of is, unsurprisingly, Amy Tan's The Joy-Luck Club. I love books that make me laugh out loud, prompting my husband to ask, "What's so funny?" There are so many funny moments, funny because they're believable, that I feel like I read almost the whole book out loud to him. I lost patience with this book. Started promisingly enough and I enjoyed the subtle incorporation of explanations of Chinese culture. But... the main character lacked likeability and I found her a bit insipid. Keltner's wry observations kill me. I'm not sure if it's an Asian-American thing, but I see a lot of myself in her words. Her detailing of life as a product of two cultures is simultaneously extremely specific and completely universal and makes for a really enjoyable summer read! It was a cute book and perfect for a light read. I found myself laughing out loud quite a bit. I related quite a bit. It is a light read and perfect to wind down. I love stories with young adult protagonists. Their actions, inner thoughts, their blunders and observations, as they figure out their life, resolve their conflicts, offers an unseen light, a different perspective than those older adults, who should have figured it all out. There is no end to learning. Wisdom is not time dependent. A few years back I completed a creative writing course at a local community college, purposely choosing community college instead of graduate level, for the sole reason I love stories with young adult protagonists. Their actions, inner thoughts, their blunders and observations, as they figure out their life, resolve their conflicts, offers an unseen light, a different perspective than those older adults, who should have figured it all out. A few years back I completed a creative writing course at a local community college, purposely choosing community college instead of graduate level, for the sole reason I wanted to be among young minds, different lives. It was a wonderful and rewarding experience. I learned so much by just listening. So, for me, Lindsey Owyang and her grandmother, Pau Pau, are The Dim Sum of All Things, the spectrum of all things in life, one end to the other, each casting their own light. And just like color, just like life, it is in the mix, the good and bad, happy and sad, that you find your place in life, your true hue. The main character in this book is so dry, critical, insecure, and hypocritical that I almost couldn't finish reading. She seems to resent her culture, relatives, and life situation, yet becomes super offended when she sense a hint of accidental cultural appropriation from someone she cares about. Can't figure out what her love-interest (who is barely a focus of the book) even sees in her. Ready to shelve this book and never think about it again. Delightful, particularly the dialogue between family members. Set in San Francisco, Lindsey Owyang discovers her true self. An American-born Chinese woman who lives with her maternal grandmother Pau Pau searches for her place in the world as she becomes thoughtful about family rituals and relationships,and learns about her family's past. Author Kim Won Keltner has a delicious sense of humor. A really fun read, hard to put down. Horrible. The description on the back made this book sound like it was going to be really good. The main character was so repulsive and I was turned off by excessive cliches and brand name dropping. The main character also was extremely childish and I could not make myself finish this book. Zero stars should really be an option. The blurb made this book sound so good. I am sorry to say it was not. It was almost horrible. I am waving the white flag and moving on. The main character was borderline repulsive, I just couldn't keep reading..
What fun! I thoroughly enjoyed reading The Dim Sum of All Things! There are so many lessons to learn from the characters. Kim Wong Keltner spins a story that kept me reading on! I had to go for Dim Sum this morning as I finished the book. Such a delightful page turner that made me feel good! I wanted to like it. Honestly, it wasn't so bad at first, but then it happened. Not to spoil anything, but close to the end Characters Started Acting Like They Are Stupid For No Good Reason. And when that happens, I cannot bring myself to forgive it, the whole thing is ruined for me. This had a surprising amount of detail and pull for a book that is this easy to read. Maybe it’s just how enjoyable it is, because it isn’t simplistic or anything. Well done. Makes you smile and laugh out loud when you read this book. A bit junky (chick lit) but I liked the exploration of cultural identity that ultimately occurred. Yes, the main character is superficial, but it comes across as a very honest telling. I love that she does stupid stuff and gets herself into vulnerable situations, like where she could have been raped by some random stranger, and yet she goes on about life, and things turn out fine. Why do I love that? Because it's TRUE! Crazy stuff like that really does happen ... we get drunk and end up pooping all over ourselves because there was never any friggin' bathroom when you needed I loved this book! Yes, the main character is superficial, but it comes across as a very honest telling. I love that she does stupid stuff and gets herself into vulnerable situations, like where she could have been raped by some random stranger, and yet she goes on about life, and things turn out fine. Why do I love that? Because it's TRUE! Crazy stuff like that really does happen ... we get drunk and end up pooping all over ourselves because there was never any friggin' bathroom when you needed one, and then having some random people hose us off in the bathtub. You just never know. Having been a single in San Francisco for many years, and having had many experiences, I could TOTALLY relate to the stories in the book. I would definitely give this 5 stars, EXCEPT. The narrator pokes fun at vegans at every opportunity throughout the book ... for example, she has a hippie woo-woo auntie who makes vegan dishes that everyone in the family avoids like the plague; and the omni narrator and her omni love interest work at a vegan magazine and get interrogated by the vegan staff ... they even have to do a "breath test" to see if they have had any meat. I actually could see the humor in a lot of these situations, and especially the part where her love interest was covering himself in hippie spices and doing something like the mambo to shake the spices all over himself, in the break room, prior to the breath test ... that was HILARIOUS. BUT! The narrator takes pot shots at vegans the whole time, and NEVER EVER gives gives them one shred of redemption. How EASY it would have been to fix this! At the end of the book, during the holiday celebration, when the auntie brings another of her lentil loafs or whatever it was ... and nobody wanted to try it, and finally at the end they did try it ... the author could have said something like "You know what, for once Auntie's crazy vegan dish tasted pretty good." I mean, the poor auntie ... throughout the whole book, she is always so caring and means so well, while being the constant object of derision because of her vegan food. It would have been so nice to give the auntie a break, show some love! Instead, no, once again, the result was that Auntie's crazy vegan dish tasted terrible. That really sucked. I mean, all the author had to do was change on sentence, and the whole thing about making fun of the vegans the entire time, would have been forgiven. For the other folks made fun of in the book, like the beige guys / hoarders, it seems they do get a chance to redeem themselves and show that they can be good after all. But for the vegans, there's just this constant rant against vegans, and it never lets up, not even at the end. :( Oh well!